Living in New England means that every summer comes to an end, and you must put away your warm weather fun vehicles. Motorcycles, boats, and cars like convertibles and sports cars, need to be cleaned and stored properly so they are ready for use when the weather turns warm again next year. It’s best to store your vehicles inside during the winter, but if that’s not possible a quality waterproof and breathable cover for these items will help to avoid moisture, mold and deterioration.Another suggestion is to keep your summer vehicles insured year round in case of damage, theft or outside weather hazards. Wash well to remove any built up dirt. Wax painted parts to repel moisture and prevent rust. Lubricate all moving parts including cables, controls, and chains if your bike has them. Park Properly Put your bike on a stand to raise wheels off the ground and prevent flat spots on your tires. Plug any openings so mice can’t nest in your intake or exhaust. The Fuel System Fill your gas tank at least half way to allow for expansion and contraction from temperature changes, and to prevent condensation. Add a “stabilizer” to prevent gas from going stale over time in the cold, and to preserve your fuel for up to a year. Drain the carburetor if your bike has one. Fog your engine with fogging oil to repel condensation that can develop from extreme shifts in temperature. Exceptions: don’t fog your engine if it’s a diesel engine, has a catalytic converter or mass-airflow sensors. Fill your radiator with enough anti-freeze to prevent water in the cooling system from turning to ice, which can damage the coolant plumbing, and the head of the engine. Protect the Engine Fresh oil will preserve your engine, so schedule your last oil change of the season for right before you put your bike away. Check and Maintain all Fluids Check, fill or change clutch, and transmission fluids if your motorcycle uses them. Fresh fluid will do a better job protecting the parts and pipes it flows through than old fluids, and low fluid levels make room for moisture to form where you don’t want it. The Battery There are several types for motorcycles: conventional lead-acid, gel-based, and lithium. They’re all compatible with a “tender,” a device that plugs in from a standard 120v outlet in your house that keeps your battery’s power level optimized over a long period of sitting static. Make sure the tender has a protection circuit that will prevent overcharging, and that your battery is in good condition before leaving it unattended with power running to it. Change the Engine Oil While this maintenance step is important for automobiles, it may be even more significant for seafaring vessels. If you don’t change the engine oil, corrosion may occur, extra moisture may build up, and you’ll be risking excessive wear which can lead to losing power, decreasing fuel economy, and even causing engine failure. Fogging the Engine Cylinders You can protect your boat’s engine until Spring by fogging its interior with an aerosol solution. Just spray the solution into the air intake via a garden hose. Without this fogging step, corrosion may form. Whether you have one warm weather vehicle or more, make sure you take the time to winterize your items correctly. 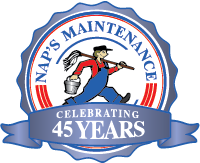 And if you need help, NAP’s Maintenance is just a phone call away!